Discuss anything related to the engine, electronics, transmission, etc. Yep. Get the bushing position correctly (left/right that is), then simply drill a couple of holes through the dogbone and the bushing itself. Then install a couple of screws through the holes. I think I used 2 screws...maybe 3. Haven't had any problems since...at least 40k miles. Before that, my volvo bushing was shifting left to right and was causing metal to metal contact between the fork that goes from the roll resistor to the firewall and the metal "ears" on the bushing itself. My drill did not agree with the dogbone so for now I cut a coat hanger, wrapped it, and tightened. So far so good. But I noticed a slight coolant leak. Maybe 3 or 4 drops and it is very random when it happens. The fluid level is fine. I think the have engine may have done it. And finally there are a few drops of water beneath the car under the exhaust pipes. No codes or anything so I think maybe a sealant and tightening will fix it. Or am I wrong? Water coming out of the tailpipe is fine. Did you visually see a coolant leak? Or was the level just a little low? Where was the coolant leak if you saw one? What year is your car anyways? warment wrote: Water coming out of the tailpipe is fine. Did you visually see a coolant leak? Or was the level just a little low? Where was the coolant leak if you saw one? What year is your car anyways? The exhaust water is closer to the center of the car and it is also random when it happens, just a drop or two, no real smell to it. The coolant is on the passenger side at the front of the wheel well. Just a tiny bit. And its an 05 montego luxury. Passenger side leak? Probably coming from the bottom of the overflow tank. Not sure about the water in the center of the car. Perhaps water is dripping from the HVAC drain? Were you running the defrost or AC? If so, that's my guess. Nothing to worry about. I had the heat on. But I figured there was a small leak since it was a common problem after the top mount goes. I tried to piece some things together after I saw the top mount. During acceleration I sometimes get this vibration in the floor board. It's not speed dependent, it's rpm dependent and after coming to a stop and starting I'll hear a "clink" kind of noise just once. All the joints are fine, so are the sway bar links, the car shifts great, the ATF is fine. Tires balanced and rotated. I'm just about positive that the exhaust system is hitting somewhere causing the vibration and the clink is the pipe or the heat shield is loose. Was checking my fluids today and noticed the TRR is offset in the bracket and ripped. Does this mean the hydraulic mounts are shot and took out the TRR? I'm also getting a vibration around 1500 rpm no matter what gear I'm in and even in park. I'm thinking I have a mount issue but can't tell when a hydraulic mount is bad. Thanks for any help in advance. Glad I read this. I bought my Montego with 94k on the odometer about 6 months ago and it now has about 99.5k. When looking over the engine before buying it the motor mount bushing seemed fine, or at least it didn't stick out to me, ie no major engine movement when I tested the engine mounts. Just went and checked it again and guess what? The mount is dry rotted and the center piece has completely separated from the rest of the bushing and the arm can freely rock back and forth from side to side. The car seems to run/drive fine but I bet fixing this bushing will get rid of some vibration I have and make the car shift better. When you're on a tight budget cheap fixes like this, the refrigerant control valve, and flushing the PS fluid are a necessity. This website has saved us over $2000 in repairs. Went and got the part. Total cost came to just under $20 which isn't as cheap as some of you have found it for but it's still much better than paying $200-300 for the Ford part alone not including labor. The part I bought at NAPA was rubber throughout with no open areas. I think that may help it to last longer. The hardest part for me wasn't using the hacksaw to cut off the "ears" on the Volvo part it was fitting the part into my Montego's TRR because I used all of my energy cutting the "ears" off! I didn't use a c-clamp, just a little elbow grease and rocking side to side. It seems to be nice and tight but I'll keep an eye on it. I read where someone used a coat hanger wrapped around their's to keep it from sliding side to side. Another redneck fix that I can think of would be to use some small hose clamps. 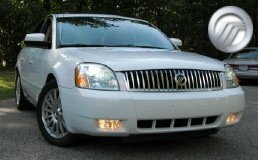 I drove the Montego out around the neighborhood and uphill a few times and there was a big difference. The car seemed fine before but now it feels as if it has more power, shifts smoother, and accelerates uphill easier. Thanks for the help! Glad this site is here! My redneck fix was to drill and install some screws around the perimeter of the mount. Down through the mount and into the bushing that is. Mine hasn't shifted for years now. I used a hose clamp. Cinched down really tight, the bushing does not slide to either side and stays put. I've got about 30k miles on my first Volvo bushing, and it's showing some slight signs of fatigue, but still works fine. I have two more on standby for when this one goes. When I found 'em for seven bucks, I grabbed three. I think I may have to go with the hose clamp. Mine seemed to be secure but after checking it today I noticed that it had moved to the side a little bit although there wasn't any metal to metal contact. I guess that as the plastic/rubber on the bushing heats up it's able to move around more easily. If you guys keep driving with shot top engine mount it will pull the bottom small mount from the radiator support and started ripping the bottom circular motor mounts to go bad. One way to check if they are bad already is to see if there is hydraulic leak from them. Motor mounts mostly have hydraulic in it and when they break they will start to loose it. If you are at over 60k miles change them all at once! If not bad bottom mounts will lead the top one to loosen up again! I have 240k miles and God knows how many times I have done this! 07 Ford 500 SEL, 6 spd. 267k miles. Ever since I read this post I have been trying to find out how can I get this done. My boyfriend looked in the middle of the car and saw that it was the bushing that is cracked and not the actual mount. I have called around to so many places and no one has that part cheap at all, because its a dealer part. I went to Maverick trying to explain this to a couple of people and everyone there with the exception of one person was like that it could be done, but you can use a universal rubber bushing piece as well. I would like to know is that true or is it best to get the volvo bushing? I have a 05 Ford 500 and its over 133k miles and is it ok to replaces the bushing or the whole mount? As well as are there any stores in chicago that carry the volvo piece? Also, are the any photos that can be uploaded so I can show the mechanic who will do it how it looks. I dont have almost 300 bucks to get this fixed and im trying to find the best way possible. I hope that someone can help. I have been putting off this repair while I decided exactly how to approach it. Interestingly, Have been having the rev problem and it was getting a little nerve wracking since I have a very tight parking spot in my garage at work. A reliable mechanic who has done other work for me, checked out the rev problem. He discovered the air hose had become loose and he believes it was caused by the upper mount problem. It may be too good to be true, but the rev problem was immediately corrected when he tightened up the hose. I will be looking to fix the mount this weekend, and I've come across a product that I think is the easiest to use for this repair. It's called SUGRU. I'm not 100% sure, but if it withstands the heat in the engine compartment it should work great. It is silicone but, but moldable by hand, similar to epoxy clay. It has also been suggested that I use pourable silicone like the type used for automotive window installation. I'd like to hear the any suggestions about these 2 options. Just wanted to update. Since the repair I've put about 6,000 miles on the car. The Volvo bushing is still holding strong! No signs of deterioration. I wound up using 2 hose clamps, one at the back of the bushing and one at the front, to hold it in place. I tightened them down nice and tight and they haven't moved an inch in 6k miles. I ordered what I believe to be the correct Volvo V70 bushing to do the roll resistor switch out. My question is this: the Ford bushing measures approx. 2 3/4" in diameter, whereas the Volvo busing is only 2 1/4" in diameter. How is it supposed to stay snug inside the aluminum bracket? I can see where I will have to cut off approx. 1/4" on each of the ends of the tube that goes through the bushing to get it to fit into the Y-arm. The diameter issue has me stumped though! Just curious why you needed the spacer and couldn't just drill through the puck and let the bolt be against the rubber puck? Any pictures? Will this allow enough movement as the current part looks like it is designed to allow some movement and not be as rigid as a hockey puck? I don't know how rigid this Volvo Bushing is?